Ceremonies to mark the official opening of the September Celebrations in Belize commenced at St. George’s Caye today. Scores of people ventured out to the island for the opening ceremonies, which began at approximately 11:30 a.m., and included a welcome address from the president of the St. George’s Caye Committee, John Searle, Jr. In his speech, Searle mentioned that St. George’s Caye was the first British settlement and its original name was “Cayo Cocina”, which when translated, means Cooking Caye. Chairman of the National Celebrations Commission, Hon. Manuel Heredia, Jr., also gave an address that included a short history of the island. Heredia said that it struck him that whenever Belizeans think of the Battle of St. George’s Caye, they often think that it was a battle that was fought primarily between the British and the Spaniards. He noted however, that historical records and archeological research on the national landmark have established that this was certainly not the case. He said that the settlement included Africans, free Creoles, the British and various people of diverse European origin, including Spanish and Portuguese in the year 1798. Heredia also said that the captain of one of the British Honduran boats was also an American, who got shipwrecked on the reef. 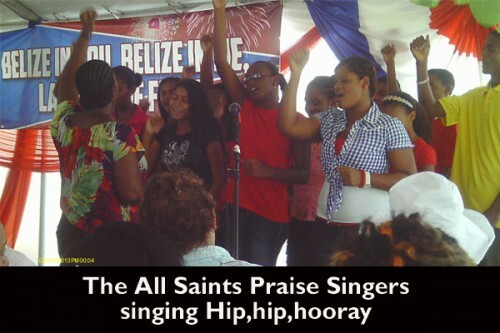 Next was the All Saints Praise Singers, who sang two songs, including the popular September 10 March song. There were a number of dignitaries and diplomats at the ceremony as well, including the Governor General, Sir Colville Young; Mayor of Belize City, Darrell Bradley, members of the Belize Tourism Board, members of the September Celebrations Commission, ambassadors and other invited guests. There was also a sailboat regatta that was held in the seafront during the day.